Your vehicle has performed without a single issue until the check engine light illuminates on the dashboard. It may not be time to panic, but it’s definitely time to sit up straight and take notice. It takes advanced diagnostic equipment to analyze your engine’s true condition. The check engine light is supposed to be an early alert that gives you enough time to get down to WCS Automotive in Rockland, MA. There’s no telling what’s wrong without professional tools. A generic code scan at the local parts store may only tell you part of the story. Actual diagnostics based on what codes caused your check engine light will ensure the proper repair is performed. Addressing any check engine light in a timely manner is important. While you may not feel any difference in the way the car runs, putting off the repair could result in additional costs. Malfunctioning fuel, ignition and emissions components can affect multiple areas of your powertrain. If you do feel a difference in the vehicle’s performance or the check engine light is flashing, you should avoid driving the vehicle until it’s checked out. Don’t end up on the side of road because you waited too long to get your check engine light diagnosed. Act fast and bring it to us as soon as possible. WCS Automotive has the years of experience and state-of-the-art equipment to perform top-of-the-line check engine light services. The check engine light’s trigger could be something as simple as a loose gas cap. Of course, we won’t charge you for that. In fact, it’s not a bad idea to check that out before even coming to us. But if that doesn’t solve your check engine light mystery, then make us your next stop or next call. We can handle whatever performance issues your vehicle is presenting. 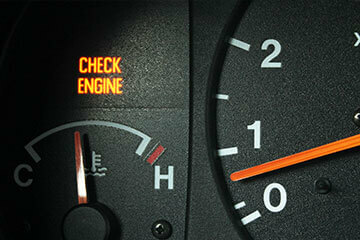 Check engine lights should not be self-diagnosed even if there are other warning signs with it. One particular problem could be the cause of another, and so on. Owners should never make educated guesses about the root cause of a check engine light. If you’re still driving your vehicle with a check engine light, then today is definitely the day to get it fixed. Diagnosing and repairing any engine problem will turn off the check engine light, and return you to worry-free driving. The check engine light is a mystery that can only be solved with top quality diagnostic equipment. As with any auto service, you’ll want to choose the right repair shop from the beginning. Make us your automatic answer to any annoying check engine light. Get it all taken care of today with our excellent same-day service techniques. Give us a call today at 781-871-1337 to schedule your check engine light repair. Make us your go-to repair shop for top quality check engine light repairs. Since you’re already online, you can go ahead and schedule an appointment right now using our convenient online scheduling system. Our expert technicians will meet you here at our facility at 1 Bishop Lane. Next time you’re in the area, feel free to stop by and meet our experts. WCS Automotive will have the most accurate diagnosis and complete repair solutions.